"When I was approached about The Bodyguard by David Ian and Michael Harrison, the main brief was that the show needed to have filmic qualities and nods to the original movie," says Richard. "But the biggest responsibility for me was having all of those huge hits in the show." From the filmic angle, Richard’s approach was to use more surround soundscapes than he had ever done before. "It’s good fun to do," he says. "It adds a level of dramatic and theatrical dynamic sound-wise. I also have more warmth in the dialogue and have added a more cinematic low end to the system." "There’s a lot going on on stage resulting in a consequently large number of inputs for musicians, radio mics, etc. There are also quite a lot of sound effects and layered sound effects, to add the filmic quality," Richard explains, "It was important to me that we had enough surface area to allow us to always have the entire band up on one layer. 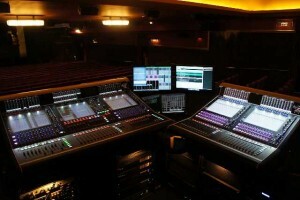 This means that Digby [Shaw, Head of Sound], who mixes the show, can mix actively if he needs to." "The dynamic EQ is standard on every channel and buss on the SD7T and is brilliant for achieving the right dynamic when the show goes from quite intimate small dialogue scenes, to songs that are full on concert scenes and are loud and rocky. To get that big, stadium concert sound in what is essentially a fairly small room, you have to ensure that there are no harsh or bitty frequencies, particularly when you’re working with someone like Heather, who has a really powerful voice. Dynamic EQ is great for that, but we are also using some tricks where we filter music down to take us ‘outside’ of the stage and then back onto the stage, which is done as a timed fade and by moving the EQ across. We also use panning, routing of surround sound effects and lots of automated stuff that works really well on the SD7T, but that I think you would struggle with on another console. We also have the added bonus of using Waves plugins on the show. This opens up an Aladdin’s cave of options for me." As far as Richard is concerned, the SD7T is an obvious choice for musical theatre. "There’s nothing else on the market that I want to use and that is capable of doing all the things I need it to do," he smiles. "I think I’ve specified a DiGiCo console for every show I’ve worked on for the past five years and, if budget allows, I’ll always go for the SD7T. "For me it’s all about sound quality. And for that, as far as I’m concerned, DiGiCo is the only way forward."